Barrel Racing started with wives of Rodeo Performers using their husbands horses at Rodeo as a fill in class and developed into a HUGE sport. Now there are Barrel Race Event for horses and riders all over the world. It is now also big business. Riders can win large purses (money), and points and.... There are saddles just for Barrel Racing, books, magazines, classes, schools, trained horses....you name it. 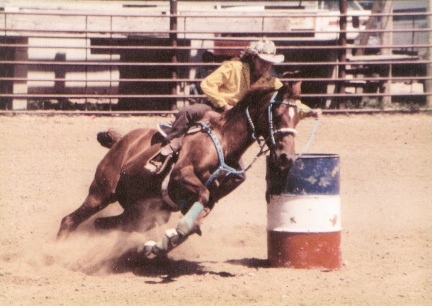 This is a photo of A friend of ours here in NW SD, Samantha riding Sunny in 2001. Samantha rides in several Rodeos and Barrel Racing Events each year...and does very well. So, when the sport of Dogs Racing Barrels came about, it was no surprise. 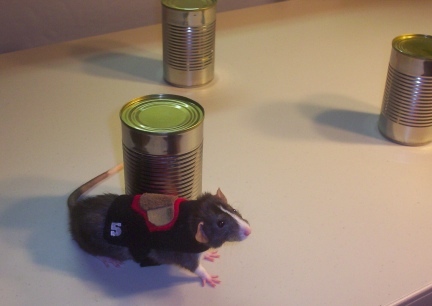 I host a Yahoo Groups list called The Agile Rat, it was suggested to me to train a rat to run the barrels. So I started Training Little Mac. I even created him a little Barrel Racing Saddle just for fun. When the same lady sent the elist a video of her Border Collie running the Clover Link, I knew my dog needed to come out and play and learn to Barrel Race too. 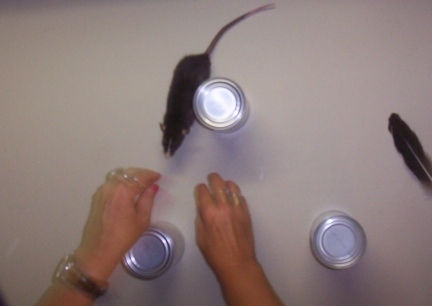 This is a photo of our pet rat pup Little Mac learning to run the "barrels". His barrels are cans of vegetables. Little Mac also runs agility courses and you can more about him and him preforming on our The Agile Rat website, see the Sister Site Menu at the right. IF YOU HAVE A PHOTO OF ANOTHER SPECIES OF ANIMAL RUNNING THE CLOVER LEAF PATTERN OF BARRELS AND WOULD NOT MIND SHARING IT HERE, PLEASE EMAIL US. THANKS! The contents of this page for Other Animals That Run Barrels is still under construction. Please check back later!